Sydney, Australia - March 21, 2014 - Altium Limited, a global leader in Smart System Design Automation, 3D PCB design (Altium Designer) and embedded software development (TASKING), announces a third party developer partnership with Octopart, a well known provider of an electronic parts search engine used by hundreds of thousands of engineers to find and compare parts across different manufacturers and distributors. Around 70-80% of the life cycle cost for a new product is a direct result of decisions made during the design phase. This is because designers are creating a blueprint for everyone else to follow and is the reason why it is very important to have the right information to make prudent decisions early in the design process. Octopart aggregates and normalizes component data from a growing number of sources providing the most complete and easy-to-use component search for designers covering component search, selection and supply chain needs. "We're excited to find in Altium a partner that shares our vision of opening up electronic part data to the world," said Sam Wurzel, CEO of Octopart. "Finding parts is half the battle in the design process. This is a natural fit and we can't wait to empower design engineers building the next generation of hardware." As a first result of the joint activities with Octopart, every Altium Designer user on a current license will get access to a brand new Altium Designer extension, providing immediate and superfast access to electronic components from 200+ distributors. This will enable every Altium Designer user to search the extensive catalog of component suppliers and distributors from Octopart from inside Altium Designer’s schematic editor, early in the design development process. The Octopart extension for Altium Designer allows users to search for information from a large number of additional distributors. As an integral part of Altium Designer’s “Design to Cost” solution, information from suppliers like Digikey, Farnell, Arrow, Allied, Newark, Mouser or TME is built into the tool. Further background about the positive Impact of Supply Chain Visibility on Design-to-Cost, is available from this white paper. 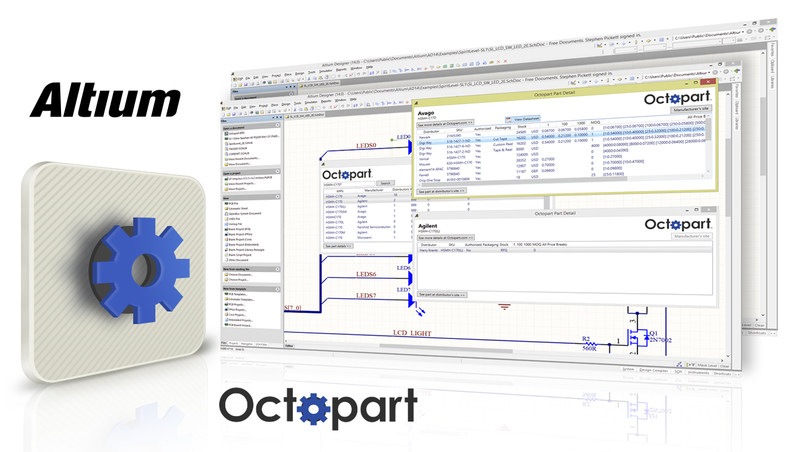 Pricing and Availability The Octopart extension for Altium Designer is available for Altium Subscription customers immediately at no extra cost. For more information, visit blog. The company was started in the fall of 2006 by a trio of experimental physicists who had a vision for a more effective way of searching for electronic parts online. The company has been profitable since 2010 and the team is extremely passionate about building tools to help engineers and scientists change the world.